The tension between the two countries led to Eritrea taking steps that were to have a ripple effect across the region - and the world. One in particular, the conscription of young men, has had a particularly wide impact. Two years before formal cross border conflict broke out in 1998, the Eritrean government took steps to maintain a large standing army to push back against Ethiopia's occupation of Eritrean territories. Initially, troops were supposed to assemble and train for a period of 18 months as part of their national service. But, with the breakout of war, the service, which included both military personnel and civilians, was extended. 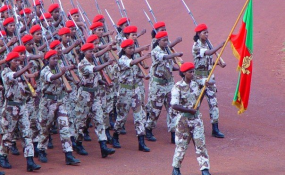 All Eritrean men between the ages of 18 - 50 have to serve in the army for more than 20 years. It's virtually impossible for Eritreans to return once they have left as refugees because the Eritrean government doesn't look kindly on repatriated returnees. Those who are forced to return to the country face persecution and human rights abuses. The Eritrean government's hard line position has led to changes in refugee policies in countries like the UK. For example, in October 2016 a UK appellate tribunal held that Eritreans of draft age who left the country illegally would face the risk of persecution and abuse if they were involuntarily returned to Eritrea. This, the tribunal said, was in direct violation of the European Convention on Human Rights. As a result, the UK's Home Office amended its immigration policy to conform to the tribunal's ruling. Eritrean asylum seekers haven't been welcome everywhere. For a long time they were persona non grata in Israel on the grounds that absconding national service duty was not justification for asylum. But in September 2016 an Israeli appeals court held that Eritreans must be given the chance to explain their reasons for fleeing at individual hearings, overruling an interior ministry policy that denied asylum to deserters. At the time officials said Eritreans were leaving the country because they were being enticed by certain "pull factors". They argued, for example, that the need for low cost manpower in the West could easily be met by giving asylum to Eritreans who needed just to complain about the National Service to obtain asylum.